I wanted to write about this for a long time.This is about the flaw in blogger which allows any admin to delete any other admin which means if you give any other person the admin rights, that person can delete your admin privileges and remove you from your own blog without any warning or confirmation, an admin just clicks on the cross in front of the user and he is deleted forever from the blog. Blogger just has two types of users : Admin and Author. 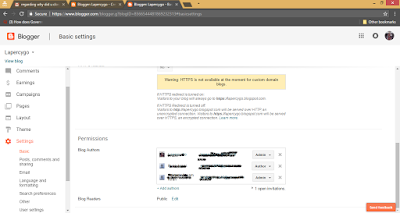 Admin can access every feature available whereas the author can only write posts but cannnot use other features such as watching the stats or changing the layout, template, etc. This is really frustrating as one has to be very careful on giving someone admin privileges. The solution to this flaw of blogger could be starting a new user group other than admin and author who could have moderate access to features of blogger. This is not a flaw. This is how admin rights work in digital world. if you make someone else a admin it means you trust him and given the full control of your content. But u make someone admin and he can remove you by a click..does that sound right?